Before there were Mustangs, before there were Shelby’s, there was the Ford “Windsor” V8 engine. Production began in 1961 for installation in the 1962 model year Ford Fairlane and Mercury Meteor. The small-block was designed as a successor to the Ford Y-block engine. The 289 cu in version was introduced in April 1963. Later, in the 1963 model year a special order ““HiPo”” 271 HP K-Code version was developed for the Ford Fairlane and Comet. The compact light weight “Hi Performance”, “Windsor” engine became an option for the Mustang starting in June 1964. At precisely that point in time the Mustang went from being a fantastic looking “secretaries” car to a true performance sports car unmatched in its all-around performance as a road going GT. This multi-award winning Mustang GT convertible, VIN # 6R08K121925, came off the line at the Ford assembly plant in San Jose, CA on October 20, 1965. Loaded with options and fitted with a K-Code engine, it is now part of the Ken Nagel collection. The stunning California native was restored to showroom condition in 2003 and was awarded 1st Gold Concours Award (684 of 700 pts.) by the Mustang Club of America Reno, NV. It was part of the Tom Gerrard Collection until December, 2016 when Ken became the next caretaker. The flawless factory code “K”, Night Mist Blue finish is nicely contrasted with White GT Stripes and White convertible top. Dual red stripe tires highlight the striking exterior appearance. The “High Performance 289” badging on the front fenders and “GT” emblem embossed on the gas cap are not there just for decoration. 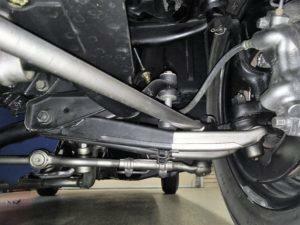 They are subtle statements about the serious performance capabilities wrapped in the sporty top down package. 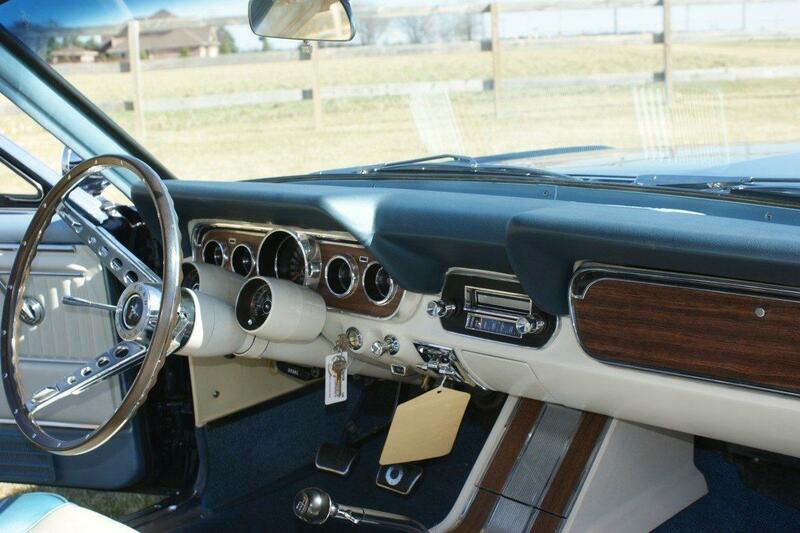 The well-appointed interior comprises the best Mustang had to offer. 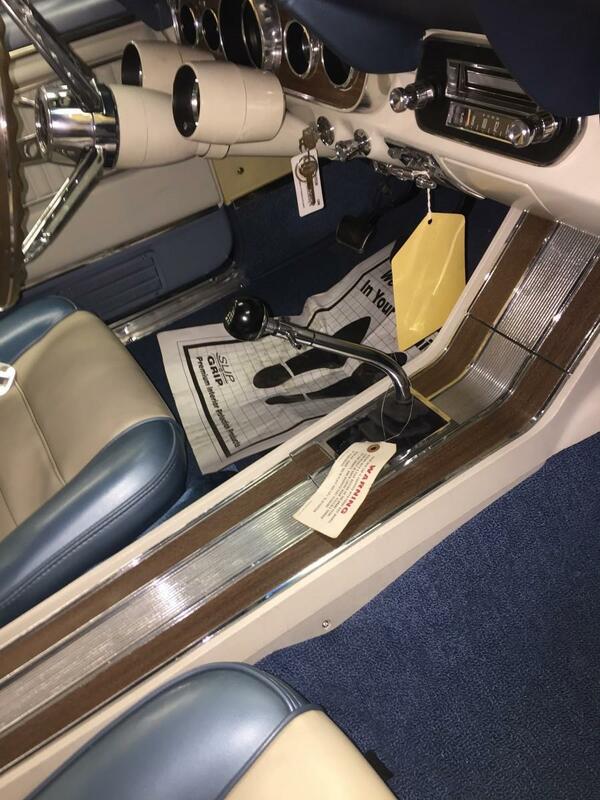 It features a blue and white Vinyl Décor Group, Deluxe Pony Interior, Wood Steering Wheel, Deluxe Seat Belts, Full Center Console, Emergency Brake Warning Light and AM 8Track Radio. Rally Pac gauges with the rare 8000 RPM tachometer let the driver know there is plenty of power on tap. Among the extensive list of options that add to the overall look are the extremely rare Luggage Rack, Illuminated Grill Pony Light and Factory Bullet Style Mirrors. 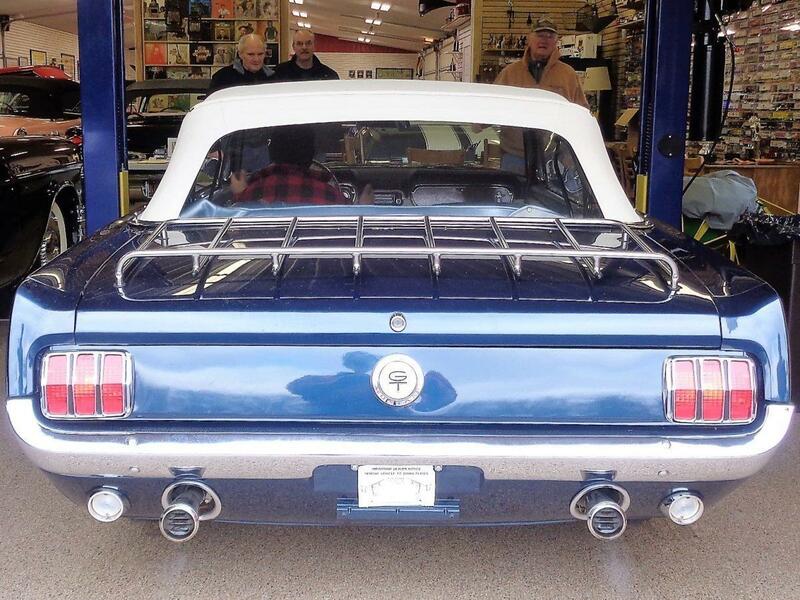 The Mustang GT K-Code Convertible on display in Ken’s collection is not only one of the finest examples in existence, is also extremely rare. How rare? Well, that’s another matter that will take some explaining. Coming up with accurate production numbers for early Mustangs is impossible and even the best estimates are subject to debate. From 1965 (1964 ½) thru the 1966 model run, production breakdown beyond coupe, fastback and convertible are not available. 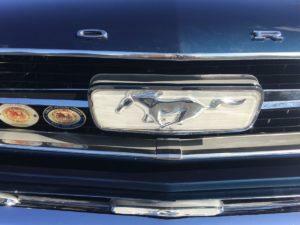 Detailed production numbers for Mustangs were not kept by Ford until the 1967 model run year. Arriving at a number for Ken’s virtually flawless 1966 Mustang GT K-Code Convertible is a tricky proposition. Using widely accepted “guestimates” from *Bob Mannel, a noted Mustang expert and author of “Mustang & Ford Small Block V8: 1962-1969”, here are some numbers to consider. 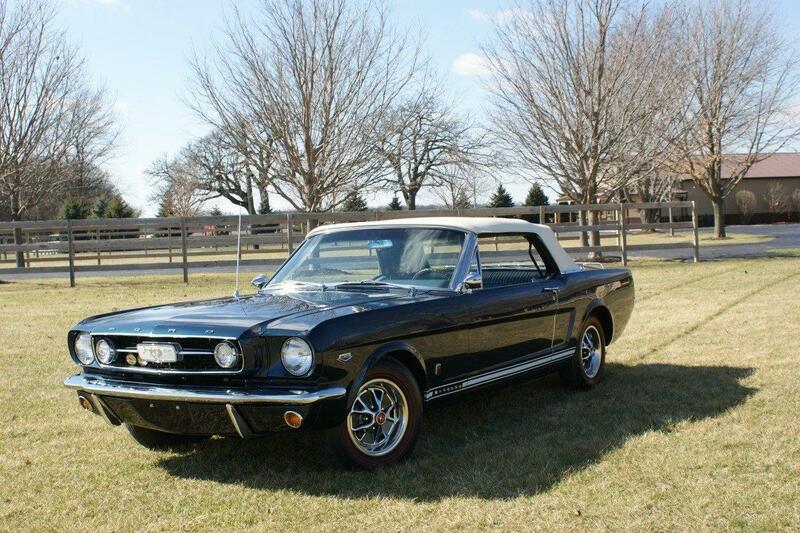 1966 alone saw a record 607,568 ponies roll off the line, a record not likely to ever be broken. 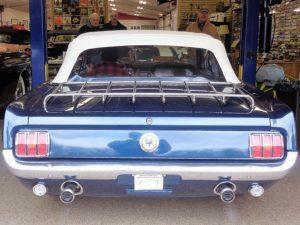 The totals by body style were: 499,751 coupes, 35,698 fastback 2+2s and 72,119 convertibles. During the K-Codes three year run from 1965 to 1967, less than ¾ of 1% were fitted with the K-Code engine. 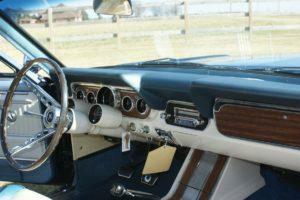 (13,231 of 1,760,678); 7,273 from introduction through ’65; 5,469 in ’66; and according to Marti Auto Works, 489 in ’67. If you are getting the idea that in relation to the total Mustang production during these years very few were K-Codes you are right. What do all these numbers mean in relation to Ken’s GT? 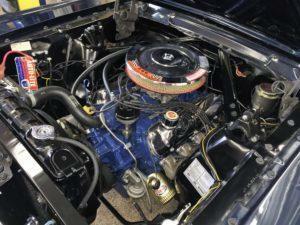 Let’s start with the 5,469 Mustangs that were fitted with K-Code engines in 1966. **Over two thousand (6 convertibles and the rest 2+2 fastbacks) K-Codes were delivered from Ford’s San Jose assembly plant in “body in white” form to Carroll Shelby to serve as the platform for the GT350. Bob believes that left about 2,500 K-Codes for “public” consumption in ’66. 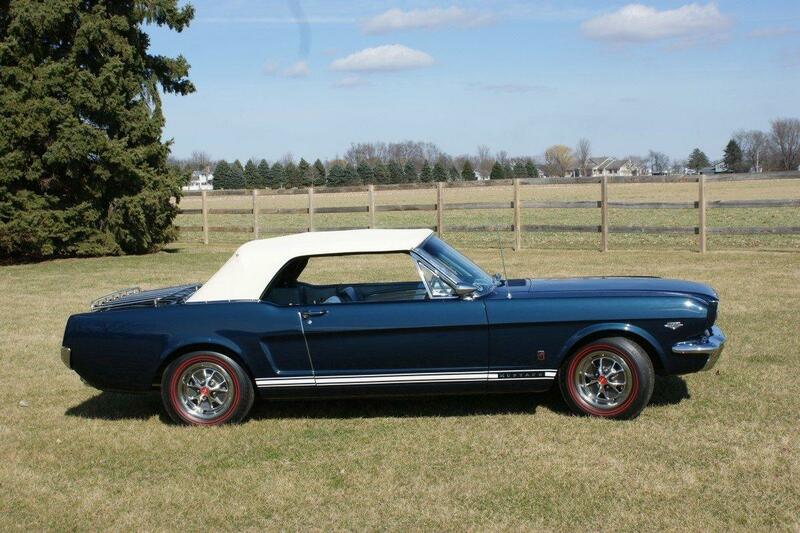 Now, factor that since the 2+2 was better suited for competitive events and that convertibles were only about 11% of total ’66 Mustang production, it’s possible that less than 10% of the 2,500 K-Codes for public consumption were convertibles. Following this train of thought it is easy to imagine that there were something less than 250 convertible K-Code convertibles made in ‘66. Consider further that not all K-Codes were GT’s and not all were configured like Ken’s example, with a 4 speed and accessorized with rare options, it is not much of a stretch to conclude that Ken’s K-Code Convertible GT is exceptionally rare. So, how many ’66 K-Code, 4-speed, GT convertibles, with all the bells and whistles were there? How many survived and are in concours condition? Way fewer than 250 would be a good bet. When we researched the market, we couldn’t find any! So, if you were wondering why you don’t see many, if any, K-Code Mustangs at local cruise nights, auctions and shows, now you know. While it will never be known for sure what the true numbers are, it is not hard to agree that these are very rare cars prized by discriminating private collectors and those who know that these cars are not ordinary every day Mustangs but true made in America road racing GT’s. 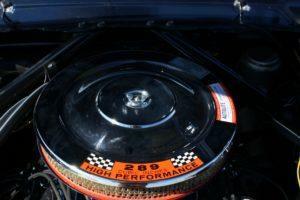 Up until the Mustang was fitted with the 271 HP K-Code 289, performance from Detroit was measured by how fast you could go in a straight line thru the ¼ mile or just beating the competition to the next stop light. 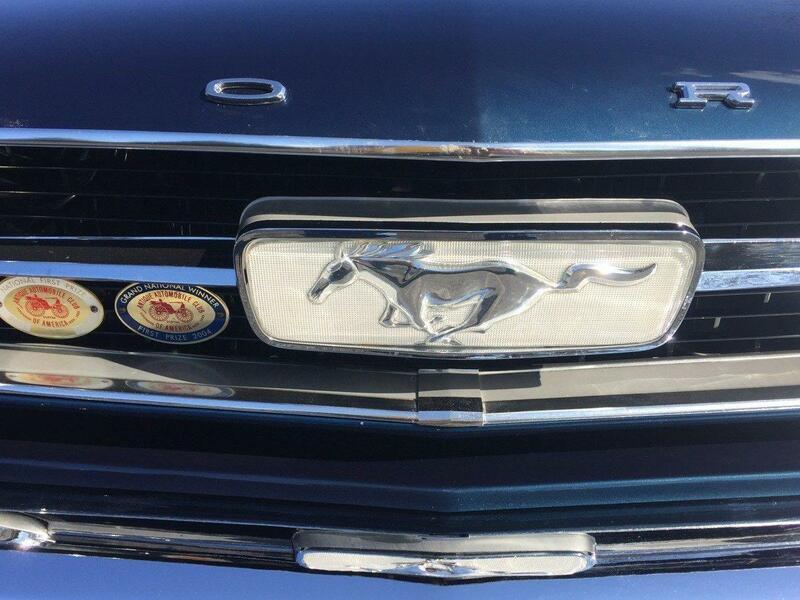 The definition changed with the introduction of the K-Code Mustang. The “HiPo’s” Special Handling Package, dual exhausts, 9-inch rear end, 6.95 x 14 dual-red-stripe tires, upgraded clutch and drive shaft put the Mustang in the class of prohibitively expensive European GT’s that could go around corners too. The 506 lb. 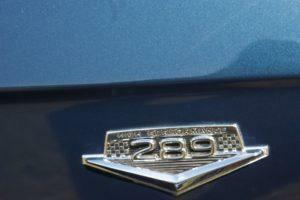 289 brought the total curb weight to only 2,770 lb. and that spelled all-around performance with a capital “P”. All for about $3,000! From the very start the “HiPo” engine was engineered for performance at high-RPMs. Ford hand-selected only flawless blocks by inspecting standard blocks with a special dye to weed out slight imperfections. These “perfect blocks” were then fitted with solid lifters, solid-lifter camshaft; 10.5:1 compression; a dual point centrifugal advance distributor; smaller combustion chamber heads with cast spring cups and screw-in studs; low restriction exhaust manifolds; and a bigger, manual choke 595 CFM carburetor. The water pump, fuel pump, and alternator/generator pulley were altered; fewer vanes, extra spring, and larger diameter respectively; to help handle the higher engine speeds. Even the HiPo’s cooling fan was unique. Bottom end improvements included; thicker main bearing caps, larger crankshaft damper/balancer and larger diameter rod bolts. The crankshaft was Brinell tested for hardness and made from 80% “nodular iron” as opposed to the stock cranks 40%. Cranks were checked for correct ‘nodularity’ by polishing an area of the rear counterweight and comparing that surface using a magnification arrangement against a picture datum. For high-rpm reliability, the crankshaft counter weighting was increased to compensate for the heavier connecting rod big ends. The increased external counter weighting at the front was split between the crankshaft damper and a supplementary counterweight placed adjacent to the front main bearing journal to reduce the ‘bending moment’ in the crankshaft at high-rpm. The “HiPo” carried SAE gross ratings of 271 HP at 6,000 rpm and 312 lb-ft at 3,400 rpm. The result was a powerful, relatively light weight, high revving engine well suited for spirited driving when installed in the light weight Mustang fitted with a competition grade handling package. Approximately 25,000 “HiPo” engines were manufactured at Cleveland Engine Plant number #1 between March 1963 and June 1967. The “HiPo” engine was used in modified form by Carroll Shelby for the 1965, 1966,1967 Shelby GT350’s. 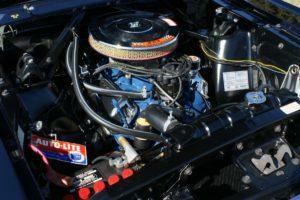 By using special exhaust headers, an aluminum intake manifold, and a larger carburetor, power was raised to 306 hp at 6,000 rpm. 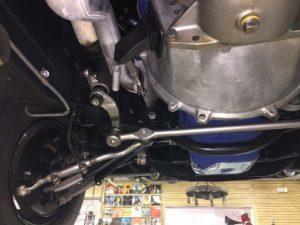 The Shelby engine had a larger oil pan with baffles to reduce oil starvation in hard cornering. Shelby also replaced the internal front press-in oil gallery plugs with a screw-in type plug to reduce chances of failure. While filming the movie “Grand Prix” in Europe, actor James Garner used a black and gold 1966 GT350 as his personal car. The car was also featured in the movie. This statement was not lost on the European sports car community. The Americans had arrived! 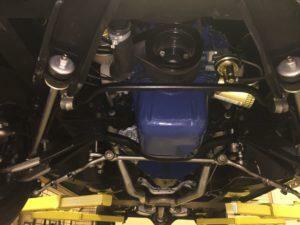 The K-code “HiPo” engine required a lot of hand work and engineering that made it an expensive option. Its popularity declined after the 390 and 428 big-block engines became available in the Mustang and Fairlane. The big blocks offered similar power for far less cost but the greater weight had a negative effect on handling and performance. 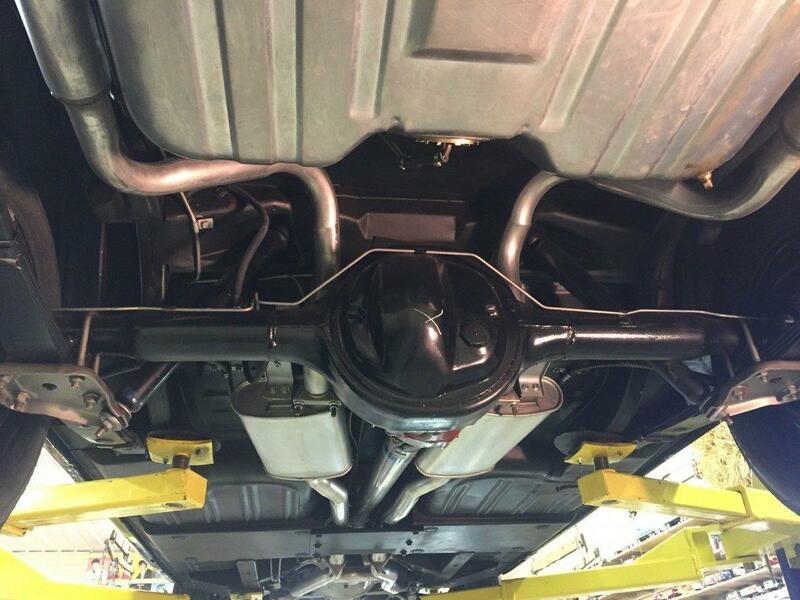 K-Code engines were available for installation in Mustangs for only three model years ’65 ’66 ’67. In continuous production since model year 1965 with over 9,000,000 sold and counting the Mustang it is a legend in the automotive world. 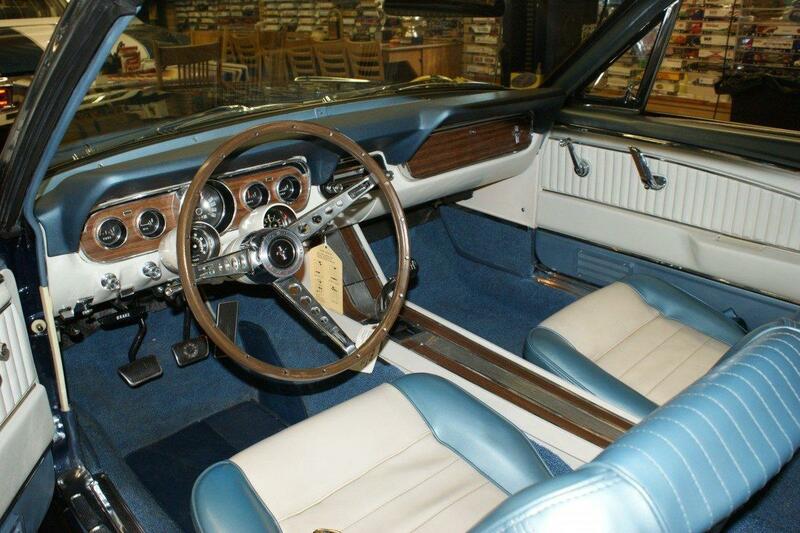 Lee Iacocca, the driving force behind the Mustang, introduced the it at the 1964 World’s Fair. The original pony car forged his reputation as one of the industry’s greatest salesmen ever, a visionary who could spot a market trend nobody else saw and marshal the forces of a huge company to exploit it. The Mustang created the “pony car” class of American automobiles, affordable European looking sporty coupes with long hoods and short rear in the form of the Chevrolet Camaro, Pontiac Firebird, AMC Javelin, Plymouth Barracuda, and the first-generation Dodge Challenger. Essentially a “parts bin” car, the Mustang was based heavily on familiar yet simple components, many of which were already in production. 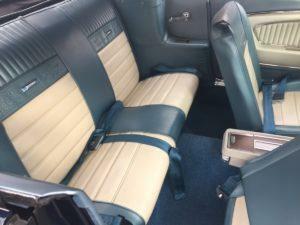 Many (if not most) of the interior, chassis, suspension, and drive train components were derived from those used on Ford’s Falcon and Fairlane. This use of common components also shortened the learning curve for assembly and repair workers, while at the same time allowing dealers to pick up the Mustang without having to invest in additional spare parts inventory to support the new model. The following are excerpts from an interview with Iacocca on the Mustangs 50th anniversary. How did you get the program’s finances to work?